Some of you asked for extras for the Deluxe Edition, so we packed it with a double side poster and a thick keychain holder/lanyard. Final T-Shirt design for the pre-ordering campaign has been confirmed. You can pre-order ANY size in the next 17 days. No worries, video updates will continue - we're going to dig deep into music! We're also working on extras for the deluxe digipak box set - follow the updates at our website to see what will come up. Thanks for your unconditional support! Spirit cooling rocks have just arrived. Stones chill your drink without diluting it. Hi guys, there's still no information about the regular EU/NA release - but one thing we know for sure: all those who support the release by joining this pre-ordering campaign - will get their copies prior to anybody else in Europe and North America and will also be able to listen to the album on the very day of release. 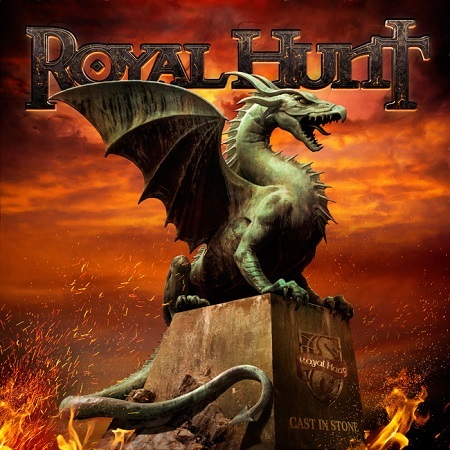 The Deluxe DIGIPAK edition of the new studio album by Royal Hunt "Cast In Stone" includes: CD 1: Studio Album "Cast In Stone" Tracklisting: FISTFUL OF MISERY THE LAST SOUL ALIVE SACRIFICE THE WISHING WELL CAST IN STONE A MILLION WAYS TO DIE REST IN PEACE SAVE ME II CD 2: Instrumental / Karaoke version of the studio album "Cast in Stone". Instrumental version has been mixed at NorthPoint Productions and mastered at Audio Planet by Jan Eliasson, DK.